Visit our Baby Pantry (The Stork's Nest) where we help young mothers and other clients with baby clothes, diapers, formula, baby food, etc. We carry baby clothes from newborn to size 5T and diapers/pull-ups through size 5. We also carry baby bottles, pacifiers, sippy cups and other accessories that young children need. All items are free, thanks to the generosity of our donors, who are individuals, churches, and organizations. We have served over 20,000 families and over 45,000 children through this program. We are always in need of new and gently used items. 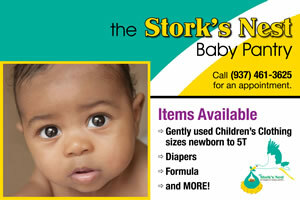 Call 937-461-3625 for an appointment to the Stork's Nest or to donate! If you are traveling to the Baby Pantry by RTA bus, use Route 11, exit at the Life Enrichment Center, and enter at client entrance in rear of building. 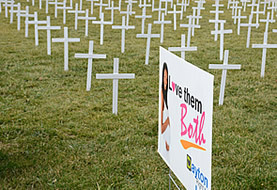 Dayton Right to Life’s Cemetery of the Innocents Project has been done in past years by St. Luke and Ascension Parishes. The Church of the Ascension has had the display for several years during Respect Life month on their property on Woodman Drive. In the fall of 2016, Dayton Right to Life joined their efforts in expanding and promoting this educational display to other locations. It will continue to be displayed at Ascension Church each October. Since Roe vs. Wade over 60 million* lives have been lost to abortion and many others scarred for life. Pray for ALL the victims of abortion. For more information on this project, contact Tom Pfahler at 937-461-3625. *60 million does not include chemical abortions and states like California who do not report their numbers to the CDC. Thank you to our volunteers who helped us set up this educational display! Each year we offer two $2,000 scholarships to young parents residing in the Miami Valley area who have experienced an untimely pregnancy and have chosen life for his or her child. The scholarship money will be paid directly to the college of the applicant's choice in two installments, to be used for books, tuition and miscellaneous fees. Click here for the Yox Scholarship Application Form. The Elizabeth Yox Scholarship Fund is established in honor of Betty Yox, retired office administrator for Dayton Right to Life. She unselfishly gave of her time and talent for over twenty years and saved many babies along the way. The Yox Scholarship Fund has provided over $30,000 to young women who chose life for their babies and want to continue their education. As a result of seeing a psychologist in high school, Amara Gadson decided to pursue a degree in psychology at Wright State. 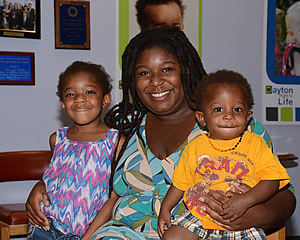 Amara began working in childcare in 2010 as a part of her plan to become a child psychologist. 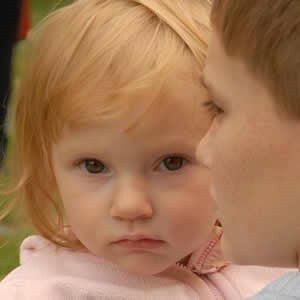 She learned valuable skills in her professional and personal life through working with children. 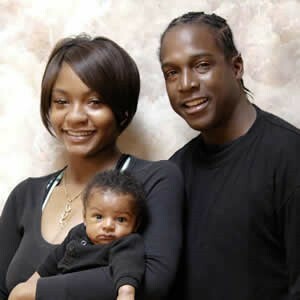 In 2011, Amara began dating her husband Stewart Butler. Although his two daughters were amazing, Amara recognized their need for love and attention. When Amara became pregnant, she followed God's leading and decided to put her education on hold and stay at home to strengthen her family. Amara and her husband now have four children. In spite of the challenges she faces raising four children, Amara writes: "...My family has become my inspiration. During my break from college, I never lost the motivation to seek more education and experience...I am determined to do what I need to do so I can reach my goals." 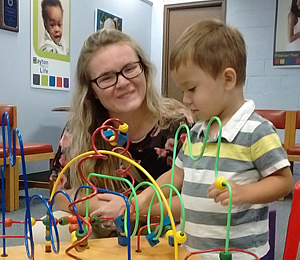 Ciera Peters is working toward a degree in Social Services at Clark State Community College. Ciera desires to help her two children with their school studies as they get older and can do so by furthering her education and pursuing a career in social work. 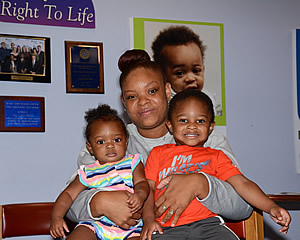 Although Ciera has faced many obstacles in her educational journey including being a single parent and struggling to afford her education, the use of financial aid and the Yox Scholarship have helped her to continue her pursuit of her degree in Social Services and to accomplish her career goals. 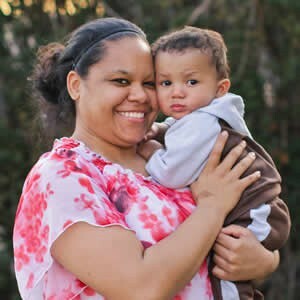 In her essay Ciera writes, "My pregnancies were very hard, especially having two babies 18 months apart from each other. I knew my decision to give them both life was the right choice. My babies are the best thing that ever happened to me and they motivate me to do well in everything, and to make sure they have a better lifestyle than I had when growing up." Victoria Bachmann became pregnant in March of 2016 during her freshman year at Wright State University. Prior to her unttimely pregnancy, Victoria and her boyfriend Jordan had discussed that if she became pregnant, abortion would be their only option until both of them graduated from college. Following an appointment at the Women's Center where Victoria's pregnancy was confirmed, the couple spent a week discussing their options and decided that with the support of their families and by continuing to work hard, they could keep their baby. In Victoria's words, "They helped me see that being a mom is the greatest gift a woman is given." Soon after Victoria and Jordan married in 2016, Jordan was deployed to the Middle East which left Victoria juggling several hats throughout the year he was deployed including being a full-time student and working 30 hours a week on top of being a mom to their son Julian. Victoria is currently working toward a Social Work degree at Wright State and hopes to graduate in May of 2019. As she states in her essay, "Being a mom has put me on the right path towards being a better person than I was before...It made me realize that I was in the wrong field and soon after, I changed my degree to become a social worker."